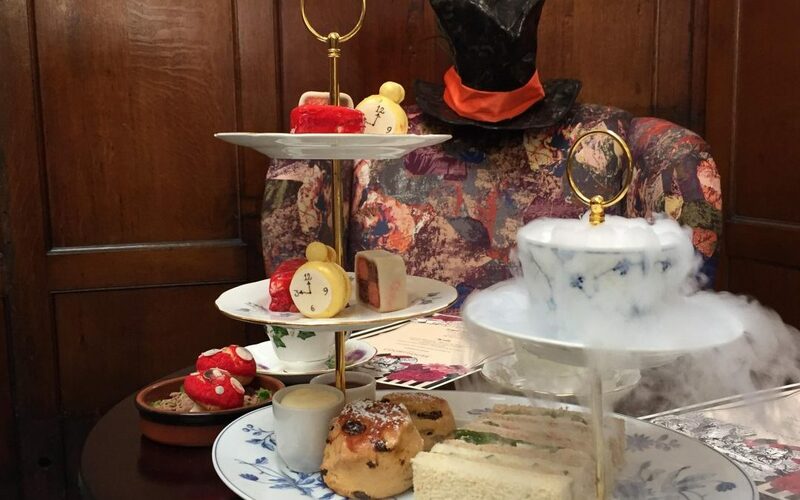 The Mad Hatters Afternoon Tea has launched at The Courthouse in Knutsford, Cheshire. The new afternoon tea is filled with tasty and imaginative treats that will immediately transport guests to the pages of Lewis Carroll’s timeless classic, Alice in Wonderland. Located in the historic town of Knutsford in Cheshire, The Courthouse is an impressive Grade II listed building, designed by renowned architect, George Moneypenny. Formerly the home of Knutsford Crown Court, the Courthouse was built in 1818 and celebrates its 200th anniversary this summer. The magnificent property has been beautifully restored by owners, Flat Cap Hotels, retaining many of its original features and is the perfect venue to enjoy an Alice in Wonderland-inspired afternoon tea. Devised by head chef, Ian Roberts, the new Mad Hatters menu features delectable themed sweets that shout ‘Eat Me’ such as Cheshire’s Battenberg, a blackcurrant and liquorice macaron, a passion fruit and white chocolate Chai tea panna cotta and a Queen of Hearts Opera strawberry and red velvet cake. These will be served with a selection of finger sandwiches including curried cod, ham and cheddar cheese, egg mayonnaise and strawberry jam and a fruit scone with clotted cream and homemade preserves. Priced at £19.95 per person, the Mad Hatters afternoon tea menu is served with a choice of locally sourced Jaunty Goat Arabica Coffee, fine loose-leaf tea by Tea from the Manor or a specially created ‘Tea Cup’ rose lemonade. Alice in Wonderland-themed signature cocktails, devised by the Barristers team, are also available. Priced at £8 each, guests can choose from Thyme for Tea, which consists of an earl grey gin, vanilla vodka, sugar and fresh lemon juice, The Hatter’s Garden Party – a beefeater gin, elderﬂower liquor, apple juice, fresh lime, mint and sliced apple or The March Hare’s checkerboard – a vanilla vodka, Chambord, almond syrup, cream soda and lemon. The Courthouse is part of Flat Cap Hotels, a family run hotel group, founded by brothers Oliver and Dominic Heywood in 2015. The Courthouse is located in Knutsford, Cheshire and launched in June 2017. The property opened with Barristers Restaurant and Bar serving inventive dining, creative cocktails and afternoon tea. The Rooftop Gardens, a Champagne Bar serving British seasonal plates is due to launch in August 2018, along with three signature bedrooms. An additional 40 bedrooms will be added at the rear of the building in 2018. 10 minutes from Knutsford is the group’s sister property; The Vicarage Freehouse & Rooms. A 26 bedroom countryside hotel, pub and restaurant at Holmes Chapel. Opened in 2015 and recently included in the Times & Sunday Times “Top 30 best pubs to visit this summer”. Winter sale at Fishmore Hall – 20% off gift vouchers!